The Olema Inn, where Mâche rhymes with Squash! On the way back from our hike in Point Reyes Sunday, Thomas, Dave, Allison and I stopped at the Olema Inn for dinner. It was, in fact, Thomas, the least foodie among the four of us, who recommended the place. He had been there before, with a suspiciously unidentified friend, and loved the place. The rest of us were a bit skeptical, so we decided to take a look at the menu before we went in. The menu, posted outside the front door of the hotel, proclaimed a philosophy that started with Chez Panisse, and was now, arguably, common among the better restaurants in many cities around the world. They were committed to using local sources and support sustainable farming practices. Each item on the menu had a pedigree, Willy Farm spinach, Epic mâche, etc. With everything that's been happening the last two days, smiles, for me, have been few and far between. But this message from a friend, in response to the Satay recipe on my Satay Tartine blog, got me grinning from ear to ear. "the beef is marinating in your Satay mixture as I type - it smells and tastes wonderful I cannt wait to taste it in a few hours. Couldnt get gangal in Queens today so I substituted young fresh ginger. The lemongrass is nice and fresh and fragrant. We are going to serve it with brown rice and snowpeas but I am sure we will concentrate on eating the meat - carnavores that we are. Maybe I can talk hubby into making some peanut sauce to go with..."
Thank you. I'm so glad you enjoy it. My dear friend Yishay Mor will be speaking tomorrow, Saturday March 13th, as part of Refusing to Kill--An evening with refuseniks from around the world. His story, as he tells it, is an account of how an ordinary man, amidst extraordinary circumstances, found courage to resist, to step out of normality and to follow his conscience. Whether or not you agree with him that resistance is a valid form of civil disobedience, his story is a compelling one, and he tells it eloquently. Then again, if you knew him, like I do, that would not be surprising in the least. If I were in London now I would definitely be there tomorrow. Yishay told me to tell you that, if you made it to his talk, do stop by and say hello to him afterwards. If you, like me, are a just a tad too far to make it out to London, you could just read the texts of his speech tomorrow. 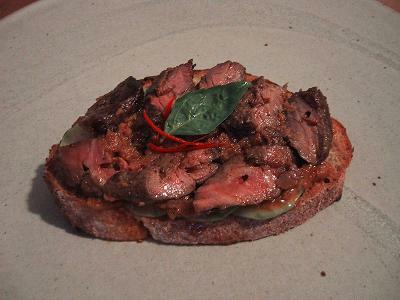 Beef satay, cucumber salad, and peanut sauce tartine. Ur...I forgot to burn my blog. In fact, it was burnt last weekend, on Sunday morning after my exhausting and exhilarating Thai feast Saturday night, using leftover satays, peanut sauce, and freshly made cucumber salad. I meant to post it last night after I returned from my ski trip to Tahoe, but I came home barely able to walk with a lame knee. Well, the knee had already been lame, since my unfortunate run-in with a tree some years ago, but I re-lamed it yet again on a suicidal, if entirely unintentional, mission out of bound at Kirkwood. Needless to say, I wasn't in much of a mood to blog anything last night. Anyway, here it is, my “My Blog Is Burning” submission. Désolé d'avoir été en retard, Clotilde. I started with a Pain Campagne purchased from Della Frattoria at the Ferry Plaza Farmer's Market, layered it with a freshly tossed cucumber salad, spread with a little Thai peanut sauce and topped with sliced beef satays. In Thailand, satays are served with peanut sauce, cucumber salad, and often a few slices of white toast. I grew up eating them like a mini sandwich all the time, so I thought I would turn them into a tartine with a decidedly Thai taste in honor of the second edition of "My Blog Is Burning!". 1. Dry roast cumin and coriander seeds in a pan over moderate heat until fragrant, then add to a mortar. 2. Pound lemongrass, galangal, shallot, garlic, cumin and coriander together until they resemble a fine paste, add the curry powder and mix well. 3. Add the paste, coconut cream, and fish sauce and stir until well mixed. 4. Slice the beef into slices about 1 inch wide and 4 inches long. 5. Mix the meat and marinade together well, set aside to marinade in the fridge for at least 6 hours. 6. 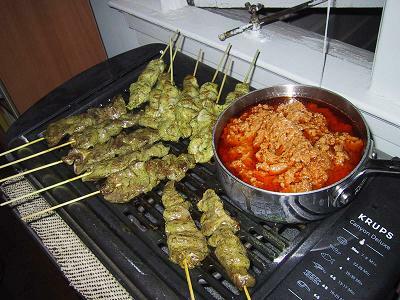 Thread each piece of the meat into a skewer, then grill until just done. Do not over-cook the satays or they will be very dry. 2. Season with palm sugar and fish sauce, depending on what kind of peanut butter you use, this will vary a lot. Use your own taste, the flavor should be sweet, salty, with a little spicy edge at the end. Toss the cucumbers and a little bit of shallots together with the chicken sauce, garnish with cilantro. If you find this recipe useful, please consider giving a few dollars to help my charity drive for Doctors without Border by clicking on the picture below. My friend Claude Kolm, of the Fine Wine Review, brought fantastic Reislings to the Thai dinner I cooked Saturday night. This was the second dinner that I've been to that Claude provided most of the wine, and they've simply been marvelous. I am not really very good at wine, you see. I don't think I am experienced enough or knowledgeable enough to really tell the difference between varieties, flavors, and aromas. Food is my thing, but wine, I have so much to learn yet. But the real problem is, I believe not too many people are good at wine either. It's all a form of collective pretending. People who cannot taste the subtlety in food have absolutely no chance at picking out subtlety in the tastes and aromas in wine, and I KNOW so many people who couldn't pick a truffe blanche out of a pile of chocolates to save their souls. That, however, never seems to stop them from forever pondering on the oak and tannin and cassis in this and that wine. Bullocks. And I'm not just talking about preference here. Everyone is entitled to their own, of course. Even I have some preferences. I know, for example, to switch to drinking beer when someone opens a bottle of California Chardonnay. I also know that most bottles of Cabernet or Bordeaux I like I cannot afford, at least not on a day to day basis. Claude is one a few whose wine palate I trust. He is an attorney by profession, but somehow manages to spend a few months a year tasting wines in France, and has done so every year since the 1970's. I don't know how he does it, really. All I know is, all the wines he's poured for me have been wonderful, and he has a way of explaining wine that makes me go, "ah I can see that". 1999 Eistelsbacher Karthäuserhofberg Kabinett halbtrocken. Full of stones, a classic Karthäuserhof and drinking very well now. 2001 Zind-Humbrecht, Herrenweg de Turckheim (thanks to Maureen) -- Seemed to me to need more time for the acidity to integrate. 2001 Gunderloch, Nackenheim Rothenberg *** (Auslese trocken) (thanks to Ed) -- probably should have been served ahead of the Z-H and I found it a little closed down but still very enjoyable. Auslese trocken is a very difficult wine to make, but there are some masters of the genre, and Gunderloch is one of them. 2001 Wwe. Dr. Thanisch (Thanisch Erben) -- The QbA's (German Rieslings that don't say Kabinett, Spätlese, etc.) from 2001 and 2002 from good estates are declassified Spätlesen and Auslesen and work perfectly with food. I thought this wine particularly attractive. 2001 Schloss Wallhausen, Felseneck Kabinett. I was disappointed by this wine, it was ok but just didn't show much class. 1997 Schloss Lieser, Lieser Niederberg Helden Spätlese. Classic Mosel delicacy with crispy, flighty fruit. The 1997 vintage is one that almost everyone (producers, importers, critics) underrated, and the wines are singing now. My favorite of the evening. 2000 Wegeler, Bernkasteler Doctor Spätlese. 2000 was a crappy vintage in which good producers nevertheless could make very good wines. The power of the Doctor here contrasted with the delicacy of the previous wine. 2000 Wegeler, Geisenheimer Rothenberg Auslese. A sweet finish. I generally think the 2000s should be consumed now, but I was surprised that this one will still need substantial time to show all its colors.